There are considerable differences between the Australian and Indonesian agricultural sector, yet decision making at business and project level requires the same skill set of knowing what to use, when to use it, and whether relevant output is created. 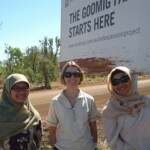 In order to empower decision makers within the Indonesian mangosteen industry, Ms Maulita Novelianto and Ms Intan Farjasari – two Indonesian public servants – attended a week-long workshop in Kununurra run by the Department of Agriculture and Food Western Australia’s Regional Economist, Francis Bright with the support of the Crawford Fund. The workshop provided them with knowledge of different decision support tools, information about when to use the tools, and how to interpret the results. The training allowed the two students to undertake a case study where a local grower wanted to know the economic payoffs of changing between two crops. Both students said the knowledge gained during the workshop will assist the industry in Indonesia. Particularly helpful were the decision support tools and adult learning principles, which are set to improve the adoption of new technologies.